What things should you take into account when assemblying furniture? Rule 1. Assemble all of the elements step by step. Please do not open all of the packages at the same time as you can mix the elements. 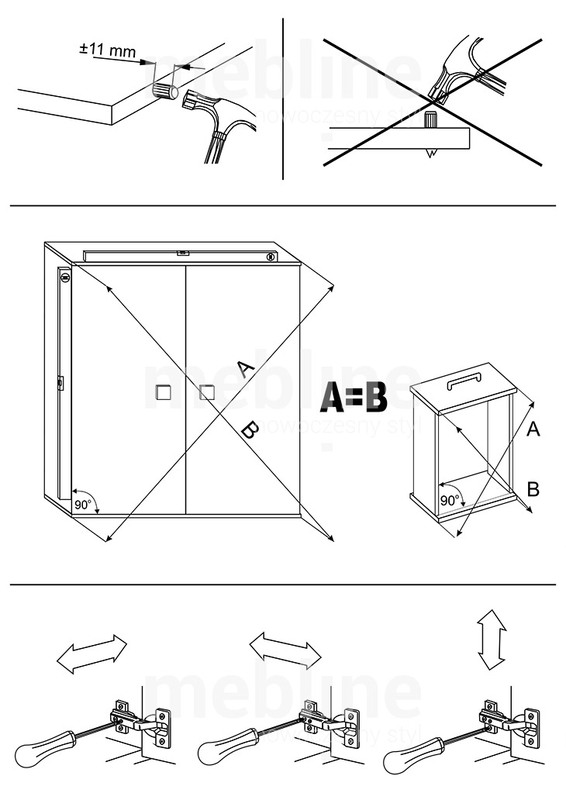 In the case of elements consisting of 2 packages and more follow the attached instruction. Rule 2. Check if the packages contain all of the elements. Before you start assembly please check if all of the elements given at assembly instruction are inside the packages. If you miss any element please contact wth us. Rule 3. Before you use glue make sure that all of the elements are assembled properly. It is very important to ckeck if all of the elements are assembled properly as after using the glue dissassembly can cause many problems. Rule 4. Do not use s much force to drive the pegs into the holes not to damage the board. All of the offered furniture are of high quality but using much force when assemblying is not recommended. Rule 5. Glue should be only used for drawers. The assembly of the rest of the elements does not require the usage of glue. Rule 1. Flip your mattress regularly. You should flip your mattress every 2-3 months. Rule 2. Remember about the air flow. Regular air flow makes our furniture to stay in good condition for long period. It refers to all of the types of furniture – bathroom / kichen or even living room. Rule 3. Control wall hanging elements. Please control if the elements hanged onto the wall are in right position or if the screws are not loosen. Rule 4. Wall Mounting Elements should be hanged onto solid walls. Rule 5. Taking care of children's furniture! Kids/Youth furniture should be used only for purposes they are made for. Rule 6.. Take care of your furniture. It should not be exposed to humidity, chemical or hot substances.